A couple have named their new baby boy after the two “hero” police officers who took them to hospital in the nick of time to give birth. 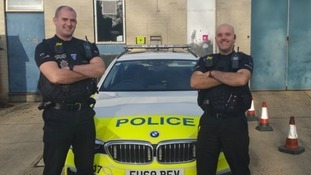 Essex Police Constables James Ireland and Dan Bellingham were caught in rush-hour traffic while patrolling the A12 heading towards Chelmsford when they were flagged down by a worried husband. The two Stanway Roads Policing Unit officers were told the man’s wife was in labour and they were afraid they would not get to hospital in time. The officers helped the couple into the back of the squad car and took them to hospital, with another of the couple’s relatives following behind in their car. During the journey PC Bellingham, whose wife had recently had a baby, not only reassured the couple but also used a pregnancy calculator to work out how far into labour the woman was, and updated the team at the hospital upon arrival. With the help of the two officers, the couple made it to the maternity unit with only 10 minutes to spare before little James Daniel was born earlier this month. Steve, James’s father, said: “We can’t praise James and Daniel enough, they are heroes.